For today's installment of Art Tools and Gears, we have with us guest artist Jonah Lobe from the USA. Jonah is a talented digital artist who specializes in digital painting, modeling and texturing for games. For seven years, he worked at Bethesda Softworks as a character artist, creating monsters, characters, armor and weapons for such popular games as Fallout 3, Fallout 4, The Elder Scrolls V: Skyrim, and Oblivion: The Shivering Isles. Originally from Takoma, Maryland, Jonah is now based in Brooklyn, New York. We have invited him to share with us his artwork and experiences in the realm of digital art. Qn: When did you discover your flair for digital art and how did you learn the ropes? That's a great question. My love of digital was gradual. Certainly, Microsoft Paint was exciting, but who could paint real art with a mouse?! Aha, but I much to learn. My first experience with Photoshop was in high school, when my friend's older brother introduced me. When I saw the graphics he was creating for his web page, I was amazed. This, I thought, changes everything! I've had a long history with art. For as long as I can remember, I've been drawing. Although I always knew that art was my future (in some form or other), I remained interested in a great many subjects, and so I did not apply to any all-art schools. Instead, I attended a more rounded college, one with a strong arts program. Between art classes, I started scanning pencil sketches into Photoshop to color them, but I did not get much farther than that until my final years of college, when I pursued an independent study with the computer animation professor. We worked in a basement, on ancient Linux machines, and I began the fumbling, stumbling, uphill climb that was computer modeling and animation! After college, I studied on my own. Information on digital art was quite easy to find on the web, even ten years ago, and so I did a ton of research and educated myself. Once I'd refined my sculpting, modeling and texturing abilities, I applied for a job in the industry, and was lucky enough to land at Bethesda Softworks! The rest is history. Character creation for video-games is an interesting, and at times, fairly technical process. Both software and hardware have evolved to a point where a so-called left-brain (hopelessly creative) artist like myself can work quite freely without having to learn a stitch of code. Computer programs, like ZBrush, allow me to create detailed artwork in digital three-dimensional space. As a character artist, I was given several pieces of concept work; illustrations/sketches rendered by concept artists under the guidance of an art director. I would use various programs - like ZBrush and 3D Studio Max - to create a three-dimensional model based on the two-dimensional illustrations. In "transcribing" the concept, I would be sure to touch base with both the art director and the concept artist responsible, to get a good sense of what it was that interested/attracted them to this particular concept. That way, when I changed things (and I often did! ), I didn't have to worry about "ruining" whatever elements they liked best. Once the model (think: "sculpture") was created, I would texture it (think: "paint"). Texturing is not just the addition of color; this is where I define the surface qualities of the subject, like roughness, wetness, reflectivity, etc. Once that was done, I would hand the model off to an animator, whose job it was to bring my work to life! The entire process took me anywhere from a week (for, say, a bow), to a month or two (for Dragons, rawr!). Qn: Where do you get your inspirations for the design of the weapons and monster characters in these video games? I take inspiration from all over! Rarely do I reference monsters that have already been invented by someone else, although these can be fantastic resources in their own right (as they can showcase great ideas, or provide examples for treatment and execution). Rather, most of my inspiration is derived from the real world. Insects, fish, mammals, reptiles... I mix-and-match the anatomy of these creatures with one another - and with humans - to create something new and believable. At the same time, I focus on personality. Nuance is important for me; a roaring mouth, muscles, spikes or sharp claws do not a monster make. The pairing of personality traits - dead eyes and a regal bearing, for instance; ravenous hunger and blunted stupidity; revolting greed and a clownish walk - these add interest to a creature, they add believability, and they make them more "human." I am, after all, a character artist! My creations are not just the sum total of their parts; they are actors, with a history and a disposition to match. Lastly, in what is perhaps the most intangible and difficult-to-describe part of my process, I try to infuse my creation with classic design principles. Even the most savage or unsettling animals possess a kind of natural grace - the result of evolution, the creature's natural aptitude with its own body - and I try to imbue my models with that same sensibility. Always, I'm both adding detail to my creations AND making them simpler, at the same time. The more complex a subject, the more important it is to group that complexity down into larger, easier-to-read shapes. So, while I might spend hours peppering a fish-monster with scales, I'll often spend just as much time fusing the larger shapes and lines of action into the whole, in order to create a structure and silhouette both balanced and memorable. Qn: What did you use to draw these beautiful tributes of David Bowie and Alan Rickman above? I used Photoshop, photo reference, and my Cintiq 21UX! I really enjoyed spending time with these faces, and reminiscing with my viewers about their respective impacts on the world. 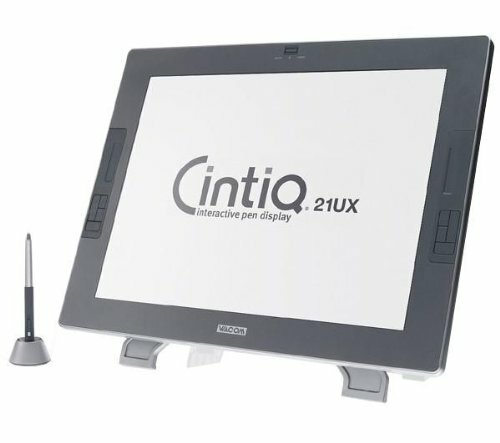 Qn: I understand that you use a Cintiq tablet for your digital art - What are some of the pros and cons of using the Cintiq tablet? Would you recommend them to fellow digital artists? I absolutely love my Cintiq. It's powerful, responsive and beautiful to look at. What's more, the use of it speeds up my workflow immensely, in both the painting and sculpting arenas. With that said, I would hasten to remind folks that having a high-end digital tablet does not make someone a better artist, nor is it necessary to create beautiful digital art. For all those years at Bethesda, I used a Wacom tablet (a more affordable alternative), and I loved that, too. So, yes, price is a considerable con. The only other con is the lack of tactile connection with my art. The push-back of a stylus simply cannot match the physical drag of lead on fine grain. Pen and ink can be a far more satisfying experience, and as much as I love my Cintiq, I will never let go of my sketchpads. Qn: What were some of the most challenging and/or rewarding experiences in your digital art career? My first would be the time I created a five-minute-long computer-generated movie during my junior and senior years at college. My computer animation class was tiny, and it was the only all-digital class in the art program. My teacher only taught part-time, which meant it was up to me to learn on my own how to work that massive, technically complex application called "Maya." I remember the first time I ever animated a character and watched it play back to me. I jumped out of my chair, I was so happy! The movie's story was ridiculous - cute aliens meet in an Egyptian temple to play dice - but I was proud of the final product. I still am! And then, oh yes, we celebrated. Qn: Have you read any book/s on digital art that you can share with us? It's funny. Digital art - being digital - changes all the time, meaning that books on digital art become obsolete in just a year or two. But not to worry! Like all things digital, information on digital art is everywhere. The internet is filled to bursting with art and the artistic community there is thriving. Don't wait, plug in! With that said, the rules of art apply to both digital and physical mediums! Some of my favorite books on art include "Figure Drawing for All It's Worth" by Andrew Loomis, and "Color and Light" by James Gurney. I've got dozens of other books I love, but those two are like bibles to me. Qn: Lastly, which artist/s do you think we should interview next? I would be very interested in learning from Luke Mancini, another digital artist. His works are bold, dynamic, and as elegant as calligraphy. One day, I hope to learn dark magic, so that I can consume his powers and wield them as my own. We thank Jonah Lobe for sharing with us his artworks and experiences. For more of Jonah's works, you may visit his website or his DeviantArt page. Jonah also runs a twitter page dedicated for fans of digital art, and you can find him on Instagram.